If you need extra cold space, you´ve come to the right place. Are you overheating because you´re running out of space to keep everything cold? 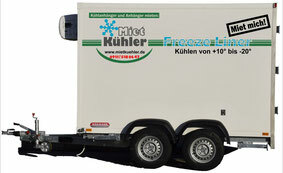 Perhaps you´ve got some extra work on at the moment and you need to rent fridge or freeze trailers to complete it? 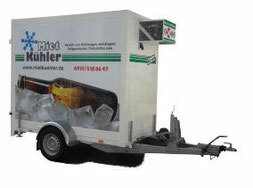 Welcome to the supplier in the North of Bavaria with a large range of fridge and freeze trailers. 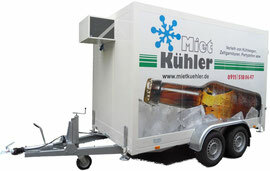 Exhibitions - extra refrigeration space where you need it. The process starts when you contact us for a customised quote based on the distance we drive to reach you. 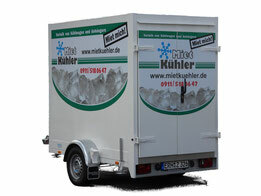 We will discuss your needs with you and help you to determine what size trailer ist most appropriate. Then we will schedule a delivery time and date. When your trailer arrives, we will set it up exactly where you want it. That includes to stabilise it and to give instructions about handling. Please click on the pictures below to view specifications. VAT included. 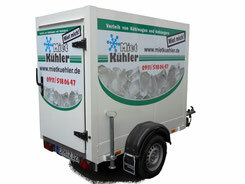 There is a delivery fee based on total kilometers, which we will calculate for you (approximately 1,00 EUR / km). Please note: Longer term hire charges at preferential rates on request.